Finally a hanger strong enough to hold your fully loaded Plate Carrier & Body Armor! The AR500 Armor® Level III Body Armor Hanger. Part novelty but mostly function! Constructed from our tried and true Ballistic Core utilized in our Level III Hard Body Armor line, and coated with our industry leading PAXCON Spall & Fragmentation Mitigation Coating. This slim-profile hanger fits standard hanger rods. Designed with specific curvatures creating a natural hanging position for your carriers shoulder straps while allowing the carrier to be quickly removed. The Compact and Snag Free design allow portability of your carrier by the hanger. 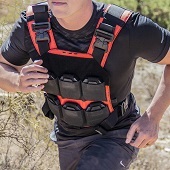 Compatible with all AR500 Armor® Plate Carrier's and most other models. "The only Hanger on the market as strong as your AR500 Armor® Body Armor"
This is a "Man's Hanger"! Very well made. Matches the plates. You could tow a tank with it. Review from Patrick S. Review by Patrick S.
Review from C.B. Review by C.B. Review from Andrew S. Review by Andrew S.